I fell in love with Mont Blanc pens, the first time I ever laid my eyes on it. I was 10 years old then and it was my uncle’s Mont Blanc 149 75th Anniversary Special Edition. He had picked one in England, during one of his many travels. And the way he cared for the particular pen was enough for me to know that it was precious. The black beauty with the gold embellishment was captivating. The more I saw it, the more I wanted to have it. Twelve years fast-forward, on my 22nd birthday, I opened the biggest gift box of that lot. It was from my older brother. Neatly covered in a tangerine lokta wrap, it weighed light compared to its appearance. Inside was a royal blue lokta gift box and immediately I anticipated to see a scrapbook. I had been talking so much about it then. Already thanking my brother for the unseen gift, I unhooked the box to find the biggest surprise of my life waiting inside. The box held a leather bound lokta journal, which wasn’t as grand as the scrapbook I had it mind, but still good and another smaller box, which was a lighter shade of olive green. At first I couldn’t understand what it was. It took me a full half a minute to realize what lay before me – a Montblanc pen. Words won’t be enough to explain the joy I experienced when I held that box. 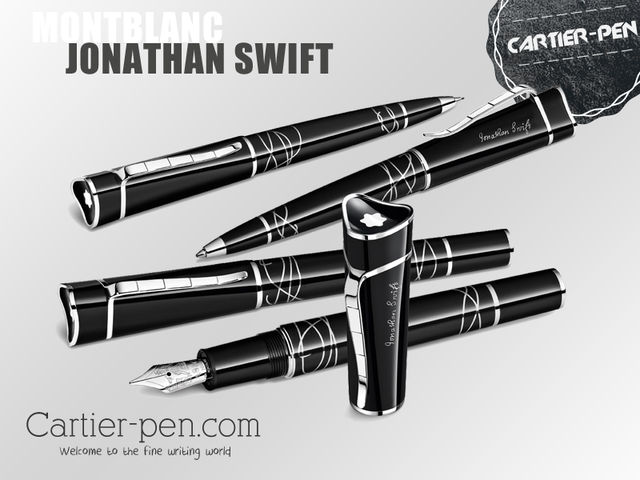 And the irony is that, what I had received was a Montblanc Jonathan Swift Writer’s Edition. Widely known for his masterpiece “Gulliver’s Travel”, Jonathan Swift was the master of satire. The 2012 Montblanc Writer’s Edition was dedicated to him and the pen is designed around the Liliput episode from Gulliver’s adventures. The black and platinum pen has a barrel made of black lacquer, which features multi-layered inlays that represents Gulliver being tied in ropes by the Lilliputians. The cap, shaped like Gulliver’s tricorn hat is made of precious black resin and flaunts an engraved signature of Jonathan Swift. The platinum clip depicts the staircase the Mayor of Liliput had to climb to be able to talk to Gulliver. Other fantastic details include an elaborate engraving of Gulliver and the Lilliputian army on the surface of the rhodium-plated 18k gold nib. The traditional white star shines on top of the cap as always. 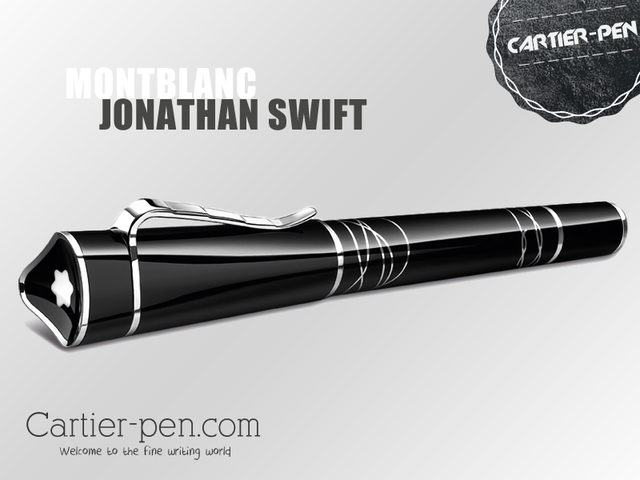 The Montblanc Jonathan Swift Writer’s Edition Rollerball Pen was not only special because it was a thoughtful birthday gift, but because it also marked the beginning of my career in writing. Earlier that year, I had joined a publication house as a writer and had my work published in print for the first time. My can-never-be-thoughtful brother had written on the first page of the lokta journal, referring to the pen, “So that it may inspire you to write your own masterpiece someday.” The pages that follow hold seeds of my imagination, still finding ways to grow, all written with the same inspirational pen – Montblanc Jonathan Swift Writer’s Edition Rollerball Pen.